Fourteen hundred years ago, the ogre king killed his own god, Senga, with a sword carved from the spine of the snake goddess. The pieces of Senga's sundered spirit washed over the world like rain and were reborn as the Sertori, living incarnations of his power. 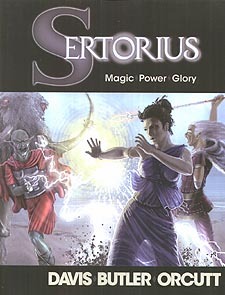 You are a Sertori: a powerful sorcerer who can bind men's minds with a word or bring down storms of fire on your foes. You live in an ancient world, ruled by monarchs and oligarchies, in search of your destiny, attracting throngs of followers and circles of believers. As your following grows, so does your power. In time, you may rival the gods, or be worshipped as one. But the power you wield is dangerous and the world you inhabit treacherous. Even as your magic destroys your enemies, it can also warp your own body and mind. Misuse of this power transforms you into an abomination or a haunting presence. The faith of your followers can grow dark as well, and even your most trusted disciples may betray you. Beyond these threats you face greater dangers from unearthly creatures and cults who despise the Sertori, hunting them down to absorb their divine powers. The gods themselves may be your enemies.